Question: Dried seaweed snacks are really popular these days—even my kids like them. How nutritious are they? What about other types of seaweed? Answer: Whether fresh or dried, seaweed is a good source of fiber, especially soluble fiber. You have probably heard of carrageenan and agar, used as gelling agents and thickeners in foods like yogurt and ice cream—both are soluble fibers derived from seaweed. Seaweed is a type of marine algae. It hasn’t always been a large part of the American diet, but given the current interest in Japanese cuisine and more sustainable food sources, it is definitely having a moment. Consumption is highest in Japan &lpar;Wells et al. 2016&rpar;, but seaweed is also important in traditional coastal cuisines of China and Korea and has its place at the table in parts of Britain and Scandinavia. Dried seaweed snacks are just one of the forms of seaweed I am seeing more of in the market. Seaweed is rich in minerals, including iron, calcium, magnesium, iodine and potassium. It also contains omega-3 fatty acids, including long-chain eicosapentaenoic acid &lpar;EPA&rpar;, just as fish do &lpar;Wells et al. 2016&rpar;. However, seaweed is low in fat overall, so unless you eat a lot of it, it is unlikely to contribute significant amounts of omega-3 fatty acids to your diet. Dried seaweed snacks are much like the nori used to wrap sushi. 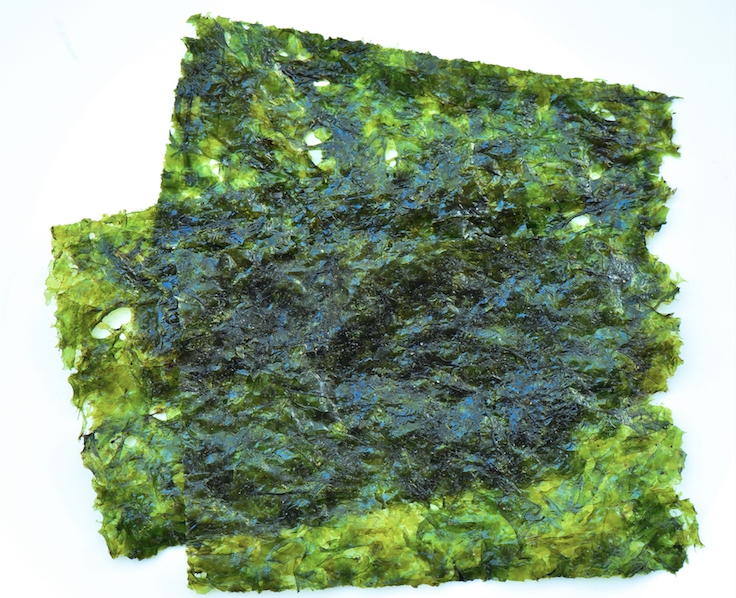 Nori is made from red algae, which is shredded and dried in flat sheets. One study found that women who consumed a sheet of gim &lpar;the Korean equivalent of nori&rpar; every day had a lower risk of breast cancer than women with lower seaweed intake &lpar;Yang et al. 2010&rpar;. You are more likely to find dried rather than fresh seaweed in supermarkets. Dried kombu is often used to flavor broth, and you have likely eaten wakame in miso soup. Because it has that briny, savory sea flavor, dried seaweed—like sea lettuce and dulse—adds depth when crumbled onto salads and into soups, beans, and grains like white or brown rice. Some dried seaweeds, including wakame, make delicious salad—they have great texture and flavor after being soaked and rehydrated. I like to call seaweed the “leafy green vegetable of the ocean,” and encourage you to enjoy more of it. Wells, M.L., et al. 2016. Algae as nutritional and functional food sources: revisiting our understanding. Journal of Applied Phycology. doi:10.1007/s10811-016-0974-5. Yang, Y.J., et al. 2010. A case-control study on seaweed consumption and the risk of breast cancer. British Journal of Nutrition, 103 &lpar;9&rpar;, 1345–53.